A new Ultrabook prototype has recently been displayed at the IDF 2012 held in Beijing. This prototype shows an interesting sliding capability called as the Letexo which helps to transform the device into a tablet, which has a touch based capability. This touch based capability computer seems to be using a similar mechanism as used by the Asus Eee Pad Slider earlier released in the market. The full sized keyboard and the screen attaches to the back of the device’s chassis. It is also believed that the Letexo is likely to be a template product, which will present more exotic form factors of Ultrabooks. 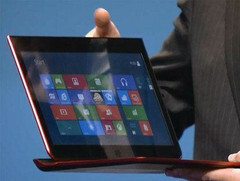 The device is expected to sport Intel’s own Ivy Bridge chips and will also have HDMI and two USB ports. Although it is an Ultrabook and a tablet convertible, but looks a bit thicker than its counterparts, judging from a video released showing the device. As the Ivy Bridge is to get release by the end of this month so we surely can expect this device not to be by this month. Apart from that it also seems to be sporting the latest Microsoft platform the Windows 8, which is also expected to get released later this year. So we may guess that we may see this convertible device later part of the year.